When people talk about the Final Fantasy series and it’s music, there are certain pieces that usually come up. One-Winged Angel, Battle on the Bridge, Dancing Mad, and the many character themes from the series are usually named. In particular a lot of people usually think of the music written by Nobuo Uematsu, who wrote the music for Final Fantasy I through Final Fantasy X. Not only has his work been rearranged and remixed by various artists, but it has also been featured in concerts performed by orchestras around the world. The more popular pieces of his tend to be from Final Fantasy VI and VII. However, there are a few Final Fantasy soundtracks that don’t get nearly as much attention as the ones previously mentioned. 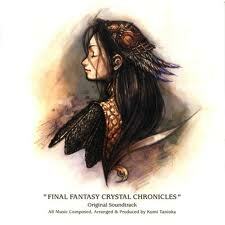 One of these soundtracks is Final Fantasy: Crystal Chronicles. 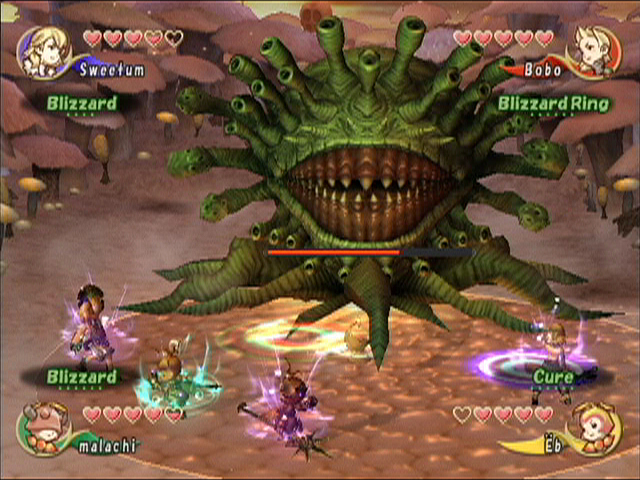 The music of Final Fantasy: Crystal Chronicles was written by Kumi Tanioka, who had previously worked on Final Fantasy XI. Two other composers are also credited on the soundtrack. Uematsu is given credit for two tracks that use the Moogle theme from other Final Fantasy games and Hidenori Iwasaki has credit for the track “Oath in Eternity” which he wrote specifically for this game. Iwasaki is also responsible for may of the subtle synthesizer effects used on the soundtrack. Together they take a very different approach on the music for the Final Fantasy franchise. One of the interesting things about the music for this game is the choice of instruments. Most games today that are set in a fantasy world use a modern orchestra to accompany the events of a game. In many cases they are mimicking the instrumentation of Hollywood scores, Howard Shore’s The Lord of the Rings soundtrack being one of the more obvious and recent influences for fantasy games. However, Kumi Tanioka takes a different approach with the music. 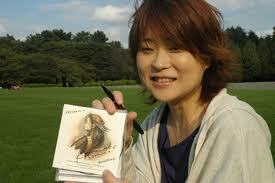 For this soundtrack, Tanioka uses a small group of medieval and renaissance instruments almost exclusively. 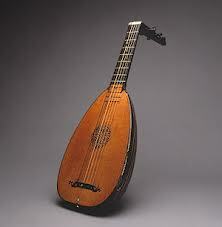 These instruments include the recorder, lute, crumhorn, xylophone, and other woodwind and percussion instruments. What results is a one of the more unique sounding video game scores of the Final Fantasy franchise. Instead of large sweeping orchestral suites and dramatic battle music with intense chorus sections, the player is treated to more intimate and smaller scale pieces with a unique ensemble of instruments. It seems odd that only this and perhaps a handful of other fantasy games use instruments from older time periods for their score. A few games use medieval and renaissance period instruments, but they are usually confined to a small selection of pieces (World of Warcraft‘s music for the inns for example) as opposed to being used exclusively for the entire soundtrack. A big part of this probably has to do with most game publishers wanting a more “cinematic score” for their AAA games. This of course means imitating movies and bringing in big orchestras or creating big orchestral sounds with computer programs. While that isn’t necessarily a bad thing, it’s nice to see a soundtrack that takes the less traveled road. This eclectic collection of musical instruments that Tanioka uses allows the score to have a unique sound that helps invoke an older time period for the game’s setting. As is usually the case for the Final Fantasy series, the setting of the game has no connection to any of the previous games in the franchise other than the names of spells/items and the types of monsters the player encounters in the game. The plot for this game is relatively simple. This time around the game takes place in a world covered with a deadly and poisonous miasma. The different races in the world live in towns and cities that use special crystals that keep the deadly fog at bay. To keep the crystals working, special caravans must go out and venture into dangerous monster lairs to retrieve “myrrh”, a valuable substance that replenishes the power of your town’s crystal. Each year you and your caravan must travel the world, battle monsters, and collect enough myrrh to last another year. On your adventures, you eventually help unravel the mystery behind the miasma’s origin and find a way to rid the world of it. The gameplay is very straightforward. You select an area of the map that you want to travel to, usually a town or a monster ridden area, to enter the different areas of the game world. The cities and towns are very small with only a handful of inhabitants. Even the world’s one city has only a few more shops than the average town. Typically you go into the towns to sell items, and craft new pieces of gear. The monster areas where you need to go are also pretty small and linear. Gameplay when fighting monsters consists of a very simple real-time combat system, only allowing you to do a three strike attack pattern, with abilities assigned to your combat slots for different types of magic spells and items that you might want to use. There are minor obstacles that either require you to get a key from a monster or find a switch that will open up the next section of the level. Bosses at the end of the area are usually simple battles, requiring a strategy of running up and hitting them a few times then backing away to avoid the boss’s very slow attack. In fact that’s the strategy that you will end up using for just about every monster and boss fight in this game. This particular Boss remains in the same spot for the entire encounter. There is multiplayer for this game but it requires that every player has a Game Boy Advance and the connector cables to hook them up to the Gamecube. So unless you know enough people who owned the GBA, a multiplayer session with this game is rare. The visual aesthetics are one of this game’s strengths, with an art style similar to that of other Final Fantasy games like Final Fantasy Tactics and Final Fantasy IX. The game still looks great today and is one of the most visually impressive games in the Game Cube library. 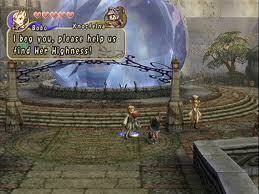 Final Fantasy: Crystal Chronicles is one of those games that doesn’t get a lot of positive attention from gamers. Although it boasts a decent Metacritic score of 80/100, most people I talk to either love or hate the game. A lot of people I know didn’t like it because it didn’t play like your standard Final Fantasy game. The trend seems to be that people enjoyed the game more when it was a multiplayer experience rather than a solo campaign. For me the game is decent, but I found the world and story itself is much more interesting and engaging than the actual gameplay. What really drags the game down, for me, is the repetitiveness of the combat system and the fact that you have to return to many of the same monster lairs each year. It may have helped to have stages that were randomly generated each time you entered them and a more diverse battle/combat system would have also provided a more engaging experience. Even the large city of Alfitaria has a small population. Kumi Tanioka’s score complements the game’s style and gameplay very well. Just about every piece features a memorable melody that will remain stuck in your head long after you’ve left that area of the game. The simple and elegant composition of the music blends well with the minimalism and simplicity of the game’s design. One of the hardest parts of writing about this soundtrack is that it’s hard to pin down what I think are the best pieces. In most soundtracks there are usually a few standout pieces that you can point to as examples, but there really isn’t a bad track for this entire game. Every town, village, and dungeon has music that sounds unique and lively. The melodies that Tanioka writes are really what keeps the music from sounding stale and avoids listener fatigue. The composer’s focus and reliance on simple melody writing is put on display in pieces like “Amidatti, and Elenor Too” for the town of Shella. A majority of the music maintains a tranquil and lighthearted feel, which complements the gameplay and world very well. Even though you spend a majority of the game fighting monsters, the music creates a relaxing atmosphere that encourages you to take your time and enjoy the environments while adventuring. Tanioka gets a surprising amount of mileage out of the small set of instruments at her disposal. Even in later levels of the game, she still manages to bring in something different. A great example of this is the music for the Dessert level titled “Treasure Sleeping in the Sand”. The track features a complex set of rhythm changes with the music, altering meter every measure in several sections of the piece. This track switches frequently between meters of 9/8 (3+2+2+2) and 7/8 (3+2+2). The constant fluctuation of the rhythm gives the music an exciting and energetic feel. The use of uneven meter also creates a more exotic sound that we’re not used to hearing in western music. One of the other pieces that deserves special mention is the single track that was written by Hidenori Iwasaki. His piece “Eternal Oath” plays in one of the creepiest and darkest parts of the game. The music is for the area of Tida, a former town whose caravan failed to gather enough myrrh for the crystal. 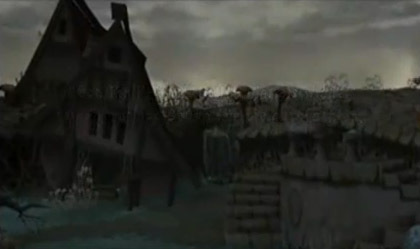 The entire level is spent moving through the ruins of the village whose entire population was wiped out by the miasma. Seriously, Tida is not a pleasant place to visit. The piece is ominous and solemn, featuring low strings, synthesizer effects, subtle percussion, and an incredibly haunting melody from the flute. It sets the mood perfectly for an area that gives the players a grim glimpse at what failing in their quest would mean. Rather than being tranquil and relaxing, the piece is tense and foreboding. The player is removed from the more comforting music heard in the rest of the game, putting them on edge as they traverse the level. This creates a great contrast to the rest of the game’s music and environments. I’m actually surprised that Iwasaki hasn’t done much composition work outside of this piece. It is probably one of the most emotionally heavy pieces presented in this game and it really demonstrates his talents as a composer. Kumi Tanioka’s music for Final Fantasy Crystal Chronicles is a great addition to the already amazing collection of music written for the Final Fantasy franchise. It takes a completely different approach to game music and what fantasy music should sound like. It’s one of the few soundtracks that actually attempts to create the atmosphere of a medieval world with ancient instruments. While it doesn’t have the grand scale or complexity of a modern orchestral score, it does do something very important. It sets a simple and relaxing tone that enhances the player’s experience in this game’s world. Crystal Chronicles may not be the masterpiece of high fantasy that some gamers were hoping for, but it boasts, in my opinion, one of the best soundtracks in the Final Fantasy series. The pieces are memorable, with simple melodies that remain in your head long after you’ve stopped playing, and the entire soundtrack is great to listen to on its own. If you’re someone who prefers having exciting battle pieces and heroic orchestral themes, this may not be a soundtrack that you can get into. However, if you are someone who enjoys simpler, calmer, smaller scale pieces of music and are looking for something a little different, then this is a soundtrack for you. It is probably one of my favorite game soundtracks and I’d highly recommend it for anyone’s video game music collection. This entry was posted in Video Game Music and tagged Crystal Chronicles, Final Fantasy, Hidenori Iwasaki, Kumi Kanioka, music, video games by Michael Hoffmann. Bookmark the permalink.